H.E. Harris & Co., Patriot U.S. Postage Stamp Collecting Kit. Published by Whitman Publishing, LLC. Perfect for the young beginner! 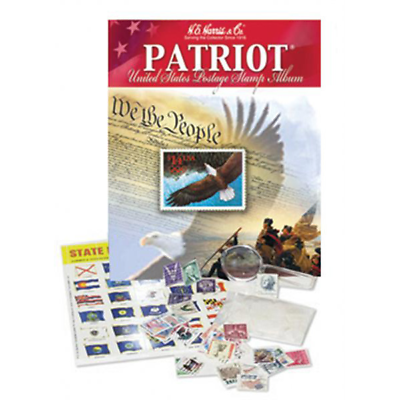 This beginner kit contains the Patriot Album, 50 different U.S. postage stamps, 100 stamp hinges, magnifier, and U.S. State Flag seals. Patriot U.S. Postage Stamp Collecting Kit. Published by Whitman Publishing, LLC. Perfect for the young beginner! Patriot U.S. Postage Stamp Album. 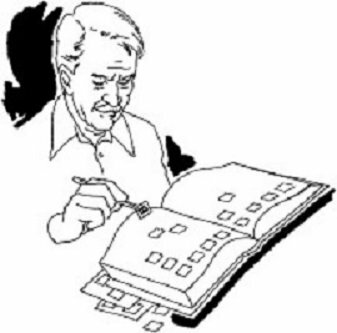 Illustrated for almost every stamp (1847-2011) a new collector might acquire, with 1600 b/w llustrations, on 69 softbound pages. Plus 50 different U.S. postage stamps, 100 stamp hinges, magnifier, and U.S. State Flag seals.